You can also download this entire module in PDF format by clicking the following link: Module 6 (PDF, 4.7MB). Students are nearing the end of the Brain Power! program. Over the last five modules, students have learned how to use scientific inquiry to perform experiments (Module 1 and Module 5), how to identify the parts of the brain and their functions (Module 2), what neurotransmission is (Module 3), the difference between medicines and harmful drugs (Module 4), and the effects nicotine has on the brain and the body (Module 5). This final module serves as a culminating activity and as an embedded assessment for the entire program. 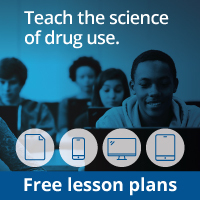 Using the information provided on four fact sheets, along with their prior knowledge, students will explain how cocaine, marijuana, alcohol, and nicotine affect the brain and the rest of the nervous system. Students may use the model of the brain, the neurotransmission simulation they performed, or any other activity - such as putting on a play, making a poster, or developing a comic strip - to explain their ideas. Students review information about four drugs - cocaine, marijuana, alcohol, and nicotine. Students apply what they have learned in the previous modules to explain how these drugs affect the brain and the rest of the nervous system. Students present their findings to members of their class.